If the concrete surfaces in your property are all ugly and worn-out, fret not. It can be transformed into works of art that everyone can truly enjoy for a long time. How? Decorative concrete coatings and overlays can be installed on patios, pool decks, driveways, walkways, front entryways, and more. They all work in both commercial and residential settings, some can be used on both indoor and outdoor surfaces. 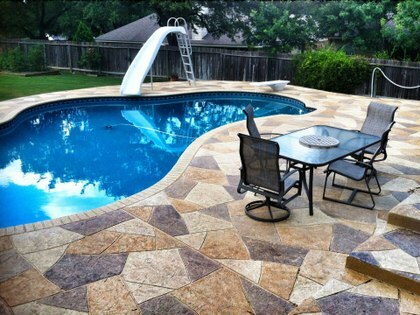 Decorative concrete resurfacing was developed several decades ago. The invention of the concrete overlays in the late 30s and the development of colors and textures in the 50s jump-started what would be the most popular option today. These are trending nowadays because of the wide range of designs available, how durable it is, and how affordable it is compared to traditional concrete repair options. Property owners are now more confident in enhancing and improving their concrete floors and outdoor surfaces, worrying less about cost and installation time. Stamped Overlay – Popular as an alternative to brick, stone, tile, and other materials, this overlay is perfect for outdoor surfaces. It involves an overlay that is spread thinly on a slab with concrete stamp patterns and textures, and then stained to replicate brick, flagstone, slate, or whatever material the customer desires. Stained Concrete – If the polished concrete has no damage whatsoever but looks discolored or boring, coloring it is a great solution. There are many different coloring methods but staining concrete is the most ideal. It penetrates deep into the slab, making it fade-resistant. These stains come in acid and water-based form. Spray Knockdown Texture – This spray knockdown finish is popular for use on pool deck and patio concrete. This concrete refinishing sprayed material is knocked down with a trowel, creating a texture similar to stucco but less intense. Epoxy Flooring – Epoxy is a durable and strong material often used in coating garage floors. It can also be used in commercial settings but only indoors because it is quite sensitive to UV rays. Polyurea Polyaspartic Coating – Similar to epoxy, this coating is popular for its high resistance to impact, abrasion, and most damage. One difference is that this is a 1-day install coating, making it a popular choice for commercial and industrial settings. Call us at (317) 854-4529 for more information on how you can know about decorative concrete solutions. More and more people are seeing concrete as a very practical and decorative choice. The demand for ornate but affordable options in the Indianapolis, IN area is so high nowadays. Indianapolis Concrete Artisans is a decorative concrete contractor in Indianapolis which offers a wide range of options for resurfacing slabs, both indoor and out. Enhance the look of any concrete surface you have at an affordable cost. Call or email us today for a FREE consultation and quote.